Denton Lotz will be retiring this year as the General Secretary of the Baptist World Alliance. Tomorrow, there is a celebration of his service. He has led the BWA through some difficult times, but has done a great job. 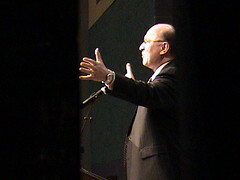 This photo is from when he spoke at the annual meeting of the Baptist General Convention of Missouri in 2005. I like this shot because it symbolizes his message from that meeting--that Christians in America need to lose our blinders and broaden our perspective to view the global community of Christians. By the way, I took the photo when I saw him through a crack in the stage curtain.